We live in an area that venerates the crawfish. On July 14, 1983, Louisiana's governor approved a law designating the crawfish as the state crustacean and so Louisiana became the first state to adopt an official crustacean! Crawfish are important to Louisiana. We catch them. We raise them and many of us make our livelihood off of them. We sing about them and most importantly, we eat all of them that we possibly can. They are instilled into the Cajun culture. Crawfish have been caught, raised, cooked, and eaten in Louisiana for hundreds of years. From the pure and simple joys of a crawfish boil in our own back yard to the rich creamy crawfish pasta dish, Crawfish Monica, which is so popular at the New Orleans Jazz and Heritage Festival, crawfish is prepared and enjoyed in many ways. Just 30 miles down I-10 from us, the annual Breaux Bridge Crawfish Festival draws huge crowds each spring in a wonderful celebration of all things crawfish, along with lots of Cajun and Zydeco music. 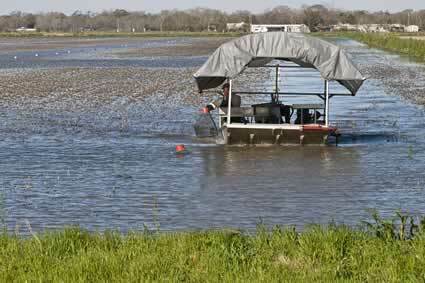 Many of our neighbors are crawfish and rice farmers. The crawfish thrive over the winter in the same flooded fields that yielded a bountiful rice harvest in the late summer and fall. Perhaps that is why the simple Cajun dish of crawfish etouffee is so good served over hot steamed Louisiana rice. In our parish (county), roadside stands selling hot boiled crawfish are a common and easy way to get dinner on the table in a hurry! The season for fresh crawfish starts sometime after Thanksgiving depending on the weather, and usually ends sometime in June. The crawfish will have plenty of cover in the grass to hide from predators, and they have tons of food (vegetation, small fish, and insects). The earliest harvest comes from the crawfish ponds and later the wild crop is caught in the Atchafalaya basin when the Mississippi River rises in the spring. 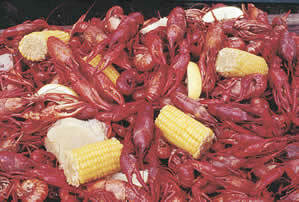 Either way Louisiana Crawfish are wonderful and available fresh during the harvest season, and frozen year round. Please, please, please avoid the imported Chinese crawfish tail meat, yes it's cheaper, but support our Louisiana farmers. A very concise history of Cajuns and Crawfish...The Cajun people of Louisiana are descendants of French Catholics who were pushed out of Eastern Canada by the English in 1755. Some of the Acadians settled all down the east coast while most made it all the way to New Orleans. They were not welcomed by the French aristocracy so they headed west and settled along the bayous of south central and south western Louisiana where they could live according to their own beliefs and customs. Legend has it that the lobsters yearned for the Cajuns so much that they set off cross the country to find them. This journey, over land and sea, was so long and treacherous that the lobsters began to shrink in size. By the time they found the Cajuns in Louisiana, they had shrunk so much that they hardly looked like lobsters anymore.